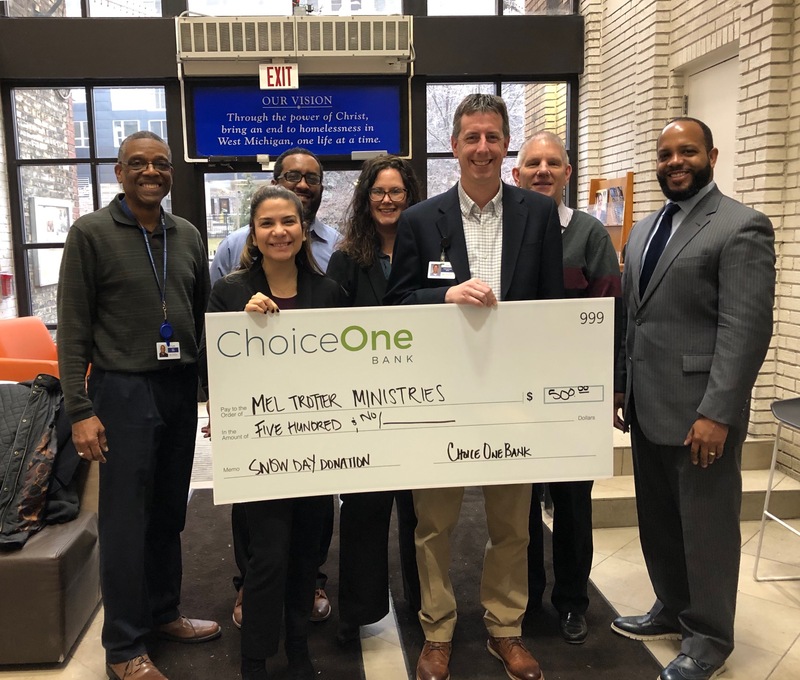 From Left, Mel Trotter Ministries’ Frank Grant, Donor Relations Officer, ChoiceOne Bank’s Bernie Seals, Mortgage Lending Officer, Eunice Lopez-Martin, Branch Manager, Patricia Brown, Commercial Lending Officer, Mel Trotter Ministries’ Tim Swiney, Chief Campaign Officer, and ChoiceOne Bank’s Scott Jongsma, Mortgage Lending Officer, and Troy Butler, Grand Rapids Market Executive. ChoiceOne Bank closed its offices on Wednesday, January 30 because of the extreme weather conditions facing West Michigan and the Midwest. Marking a historic decision to close all offices, key staff were able to serve customers and ensure all vital functions were performed at the Bank. In addition, ChoiceOne Bank offered a “Surviving the Storm Jeans Day” to all employees upon their return to work. Employees typically pay $3 to wear jeans, and then donate to a local charity. This Jeans Day, the Bank paid and employees voted to donate the Jeans Day money to the Mel Trotter charity. Mel Trotter Ministries served as a warming shelter for downtown Grand Rapids residents.